Photo Left - Natureglo's dog Rochelle Claire, as a teenage pup, peering around a plywood door she had chewed. Click through the species of interest. FAMILY CANIDAE(canines) from the Brittanica website. Where Brittanical leaves out links, I supplement by leading to you to a GREAT site called Arkive. 36 species in 12 genera found worldwide, not including the Falkland Island wolf (Dusicyon australis), a foxlike species that was hunted to extinction in the late 1800s. 12 species of Europe, Asia, and Africa, including the Arctic fox of the northern polar region. 6 species of South America. 2 species of North and South America, one of which lives only on the Channel Islands off the California coast. 1 species of South America. 1 species of eastern Asia. Daily Dog Discoveries - "I am Your Dog's Uterus"
Procedure: Sit on a smooth floor surface with the cups and treat. Have the dog sit or someone hold the dog about 6 feet away from you. Put the two cups on a smooth floor surface. Put one of the treats under one of the cups. Mix the cups up very quickly in front of the dog. Keep the cups about three feet from each other. Point to the cup with the treat in it. See if the dog follows your cue and gets the treat under the correct cup with the treat in it. Repeat a number of times. Make up your own experiments with the same idea of the cup and treat. Perhaps play hide and seek and point to where you've hidden the cup as a variation. Note: This experiment shows how dogs are responsive to human eyes which reveals their great intelligence. What you need: at least 2-3 willing people. Blind folds accept for one person. A dog. A place for people to sit in a row next to each other. Treats readily available. All the people sit down in a row on a sofa or chairs. Have one person sitting there without any blindfold on while the rest of the people sit there with blindfolds on. Observe what the dog does. Try variations with hiding treat among yourselves. Dog treats. A dog. At least one person to do the experiment with the dog. Place a treat on the floor in front of you. Call your dog over and ask it to sit. Leave your eyes open and see if it's obedient. Assuming the dog is obedient, ask the dog to sit and stay then close your eyes. Repeat sit and stay with your eyes closed a few times. Give the dog a few minutes with your eyes closed. You can make up your own variations with this experiment. As with all experiments, record the experiment procedures and the results you get in your journals. Share your journal work, photographs and or videos with the class. Smell Game - You can how I tried this very simple experiment with my dog here. One at a time in any order, lay each of the objects down in front of your dog to allow them time to smell each of them. Use a stop watch to record the length of time your dog smell each of the objects. Time each one separately. Make observations and record what you observe and what the results are per object. Here are some question helpers. 1). which object did your dog smell the longest? The least? 2). Why do you think your dog smelled one particular object the longest? The least? 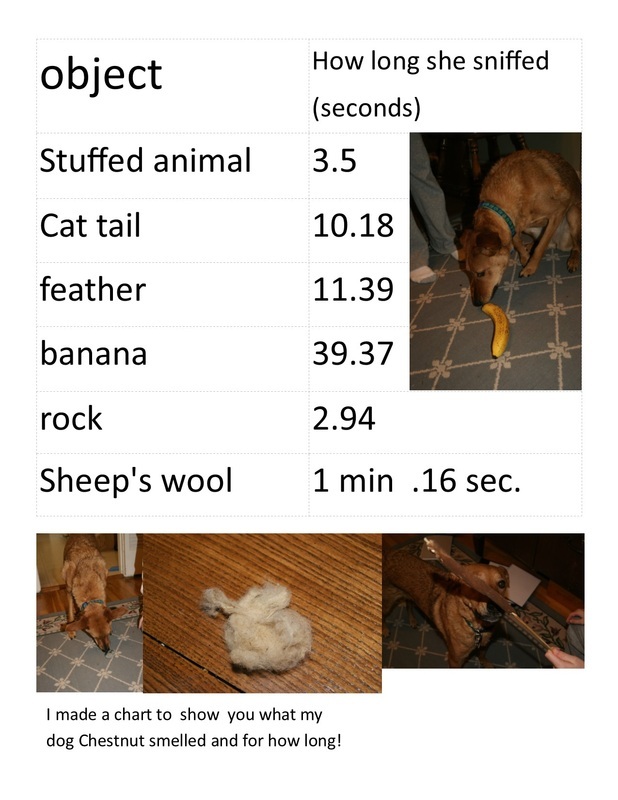 Below Mammals Oct. - Dec 2014 student, Josh A. has expanded a smelling experiment he did with his dog, Chestnut. 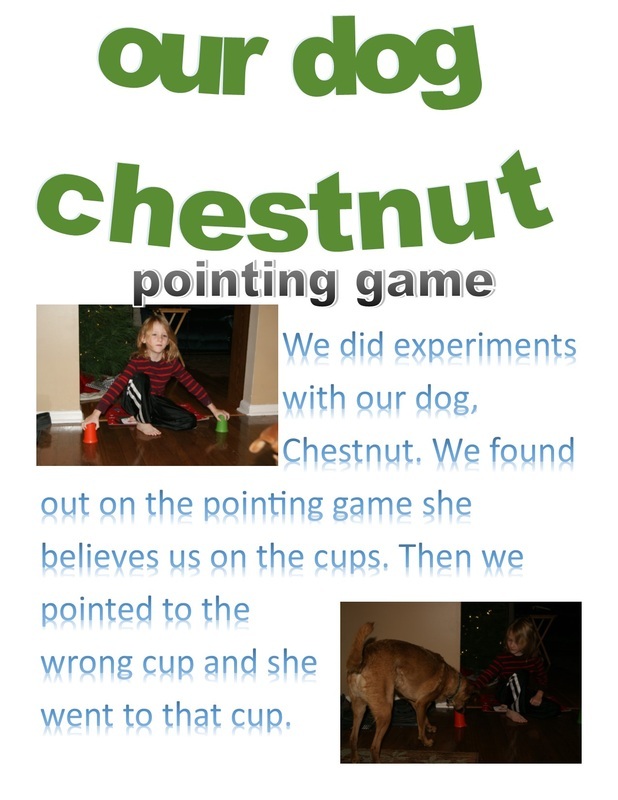 Below, Josh's broghter, Kevin A., has done the pointing experiment with their dog Chestnut.